So this isn’t really anything connected to our work on insecurities, yet somehow i felt the need to put something together considering the recent loss of the actor Gene Wilder, often known by a lot of the current generation as the original Willy Wonka. The man himself was a revolutionary in thinking, in a world that at the time maybe rather he was not. The point of Thinking Evolution, as I have said time and time again, is to take information and understanding of your world, as you choose to see it and make judgments based on what you see and what you want to believe, rather than people following the ideals of the masses, fitting their ideals of themselves and the world into a predetermined marker- “you will do this.” Nothing should be predetermined, nobody and nothing has the right to tell us how to live our lives. This society can be so limiting, but if we choose to break free of the shackles of mediocrity and the “done thing” we can be something truly beautiful, if we choose to be. “Come with me and you’ll be, in a world of pure imagination.” I’m sure we all know the scene, the wander into the main room of chocolate, wonderful creations you would only expect to find in a child’s imagination, yet there the characters stand, all in such awe of what they are seeing. What is this? Well as Gene Wilder breaks into song, it is simply “Pure Imagination.” It amazes me how oddly my mind works sometimes, because the man’s untimely death seems to be the catalyst to me seeing this 4 minutes from 1971 in a much more meaningful way. I feel like we could all take something from this. I am not saying we should all live in a fantasy land, but maybe we could take a modern twist on the idea. We obsess over not dealing with what we imagine, these hopes and dreams we often dampen down to deal with the day to day realities of modern life, so we lose something so important. Its as if we lose a lot of emotion to the ignorance of our imagination, which is terrible, because i feel like it could make the world a much more beautiful place. Willy Wonka lives in a world of creating things that shouldn’t exist, in moving his world forward, creating something unique, making his mark on his own wonderful world. He imagined himself doing something, then off he went to do everything and anything he could to get that point. I’m not saying build a river running with liquid chocolate, but surely we can take something from the idea of pure imagination? Maybe start something, imagine something going our way, choosing to believe it will happen and see what we want as more than just a fantasy? Imagining something isn’t unreasonable and shouldn’t be seen as “distant from reality.” If you wish to be free, to be what you want to be, to do what you want to do, to live to love and jump that much higher and reach that thing that you’ve been telling yourself probably isn’t possible. 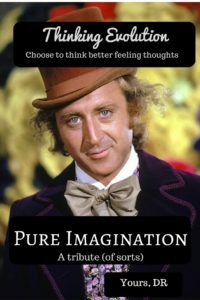 Why not live to the ideal of pure imagination? If something lets you down, see it as a lesson, not a failure, it shouldn’t change where or what you hope to be.